Hello there! It's been too long, and I've missed being here on the blog! Let's get right to a card, okay? I was in a clustery mood the day I made this. Lots of little goodies were piled onto a doily die cut (Colorbok): sequins, pearls, little roses, a shiny button. A sentiment from Papertrey Ink's Lighten Up was stamped on a fancy tag die cut (Spellbinders) and nestled under that cluster. The primary reasons for my absence here: not only is life in full swing with my job and my family, but my computer has been "sick" for quite some time. I can't load any new photos on, or even photo-edit the ones I've got because of a computer-memory issue. (I've got memory issues of my own, but that's another story altogether.) The repair man was supposed to have come this past weekend, but had to cancel, and we are rescheduled for his "house call" this weekend. Fingers crossed he can fix what ails this computer of ours! 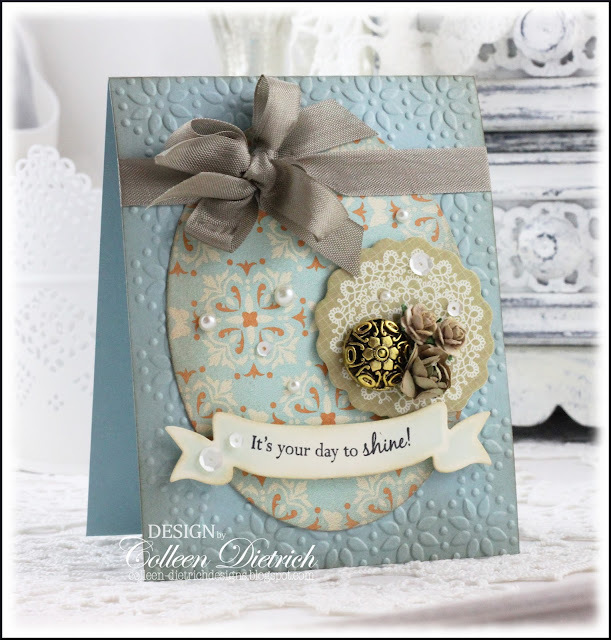 Stamps: Lighten Up - Papertrey Ink Paper: Bashful Blue, pattern, Very Vanilla - Stampin' Up! Ink: Antique Linen, Frayed Burlap - Ranger; Memento Tuxedo Black - Tsukineko; Soft Sky - SU Fibers: Mottle Brown seam binding - Hug Snug - The Zipper Stop Accessories & Tools: Marshmallow sequins - Pretty Pink Posh; Fancy Tags, Classic Ovals Large dies - Spellbinders; gold button sticker - Jolee's Boutique; small taupe flowers - iamroses.com; doily die cut - Colorbok; Sugar embossing folder - Sizzix; pearls - Recollections, Queen & Co.
Looks like it's snowing on these leaves, doesn't it? It was not my intention, but now that I'm writing my post and looking at these pics, that's what stands out for me. 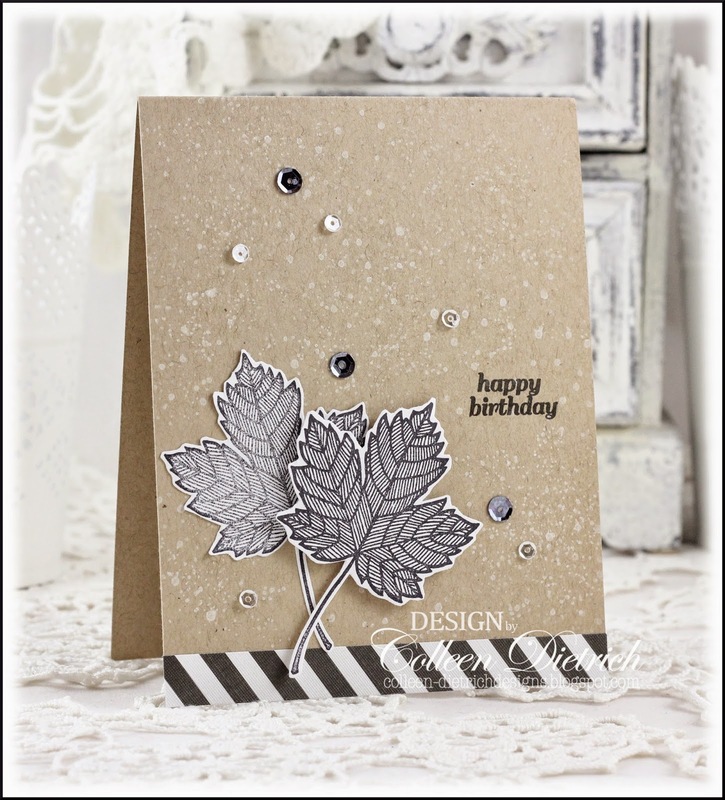 I only meant to give a distressed look to the card, but in a soft and subtle way, letting those black and white leaves take center stage. 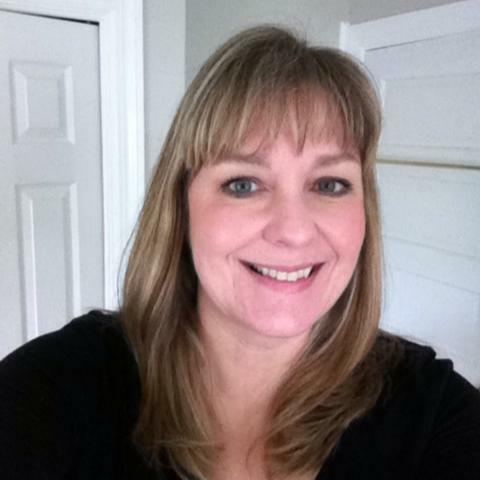 Back in the fall, at my Stampin' Up! demonstrator's fabulous sale, I picked up Magnificent Maple. I LOVE IT. 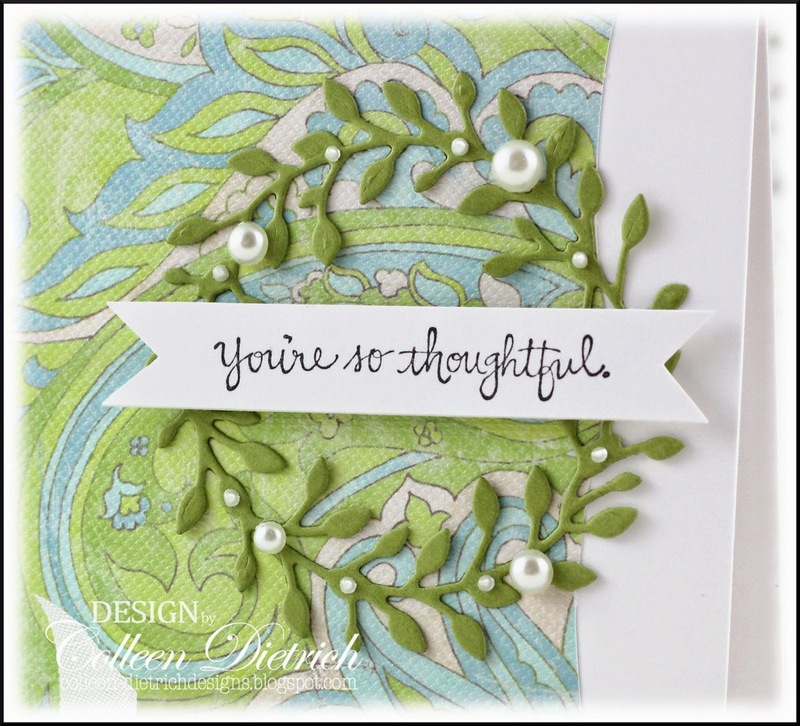 I mixed it here with Itty Bitty Backgrounds, a sentiment from Inspired By Stamping, and a scattering of sequins. Oh -- the leaf in the back was stamped-off once, so it is not as intense a black as the one in the foreground. I think this card has a masculine edge, but even I would welcome this! Memory Box cake is yummy! Hello everyone. :-) If the feel of this card looks familiar, perhaps you saw this post of mine a little while back. 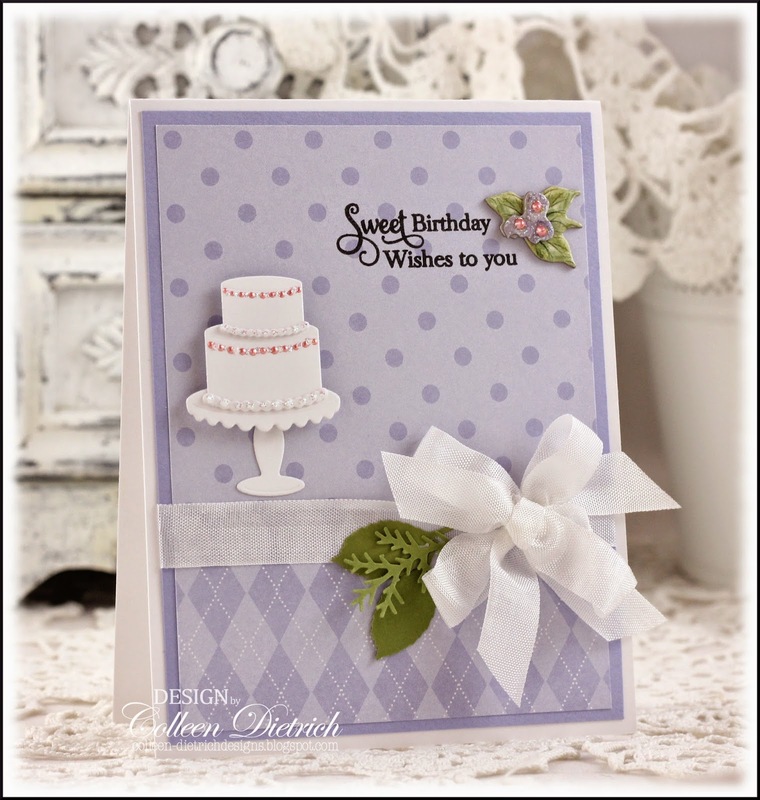 At the time I created this, the Memory Box cake layers and stand dies were new to me. I wanted to decorate a cake, a paper cake. I did not do a great job, and need to practice some more! 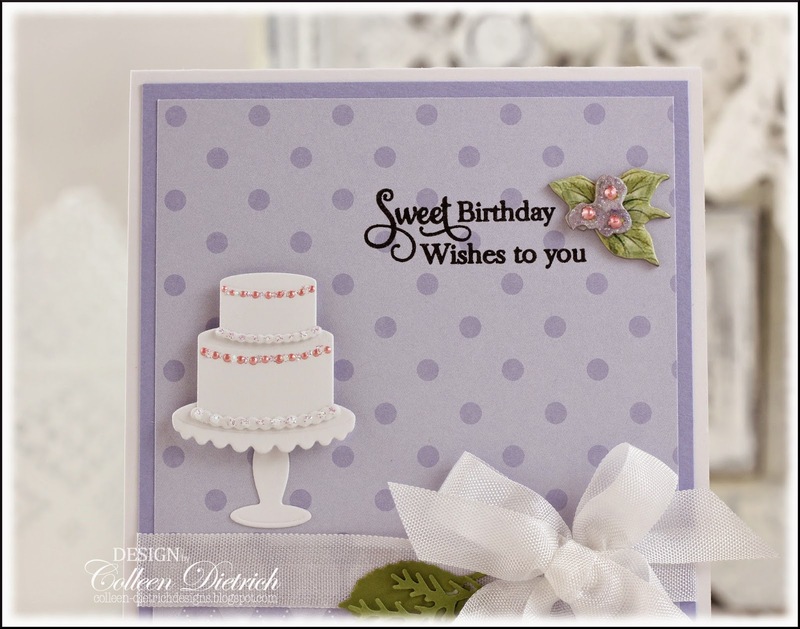 The Inspired By Stamping sentiment goes really well with a confection like this one. My friend likes preppy patterns, a la Lilly Pulitzer (just type that name in an Internet search, and there are oodles of examples). This paper from the Wild Raspberry Matstack / K & Co. was a good option. It already had a fancy shape to it, since it was meant to frame photographs. I lopped off portions of it, and mounted it to one side on a white card base. 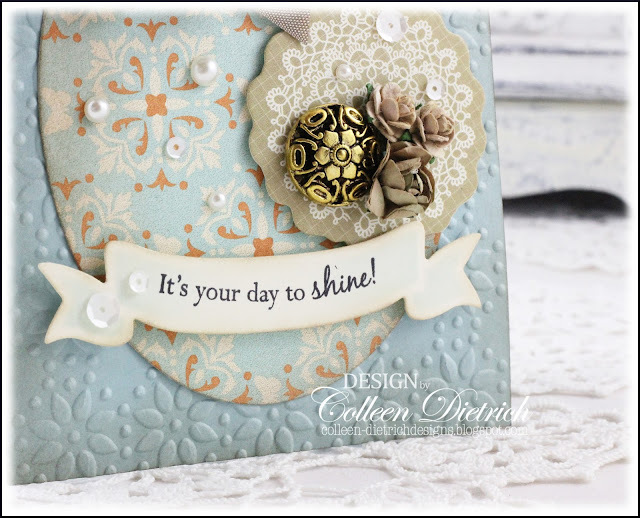 The Poppystamps Breezy Wreath / Memory Box die cut was adorned with pearls, and a sentiment from Stampin' Up! 's Absolutely Fabulous on a hand-trimmed banner. I am so pleased with how this turned out. My friend likes wreaths as well as paisley patterns, and the two elements came together beautifully (especially with the addition of my favorite pearls!). This is one of my favorite holiday cards that I created for Christmas 2014. 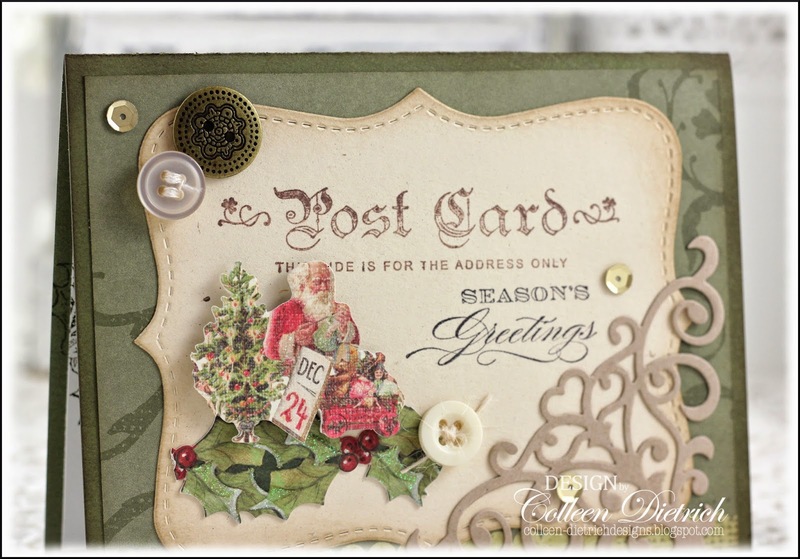 I think it's that post card element (Winter Post / Stampin' Up! ), combined with a beautiful Anna Griffin sentiment right beneath, all arranged on a Top Note die (SU). Or maybe it's the scattering of vintage buttons and sequins. 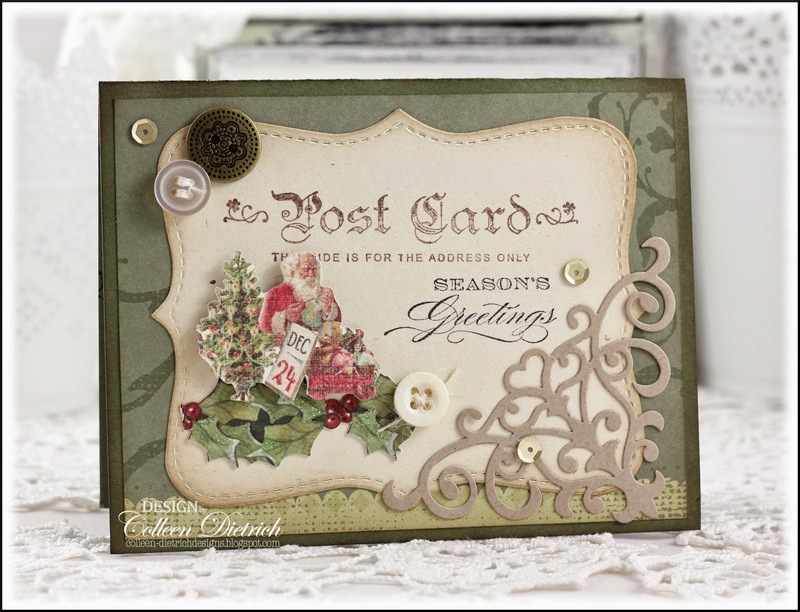 Or maybe the fancy corner flourish by Spellbinders, or the vintage-look K & Co. die cuts (Santa, holly leaves and berries). Hope you've enjoyed seeing this one today. :-) Thanks for coming by! 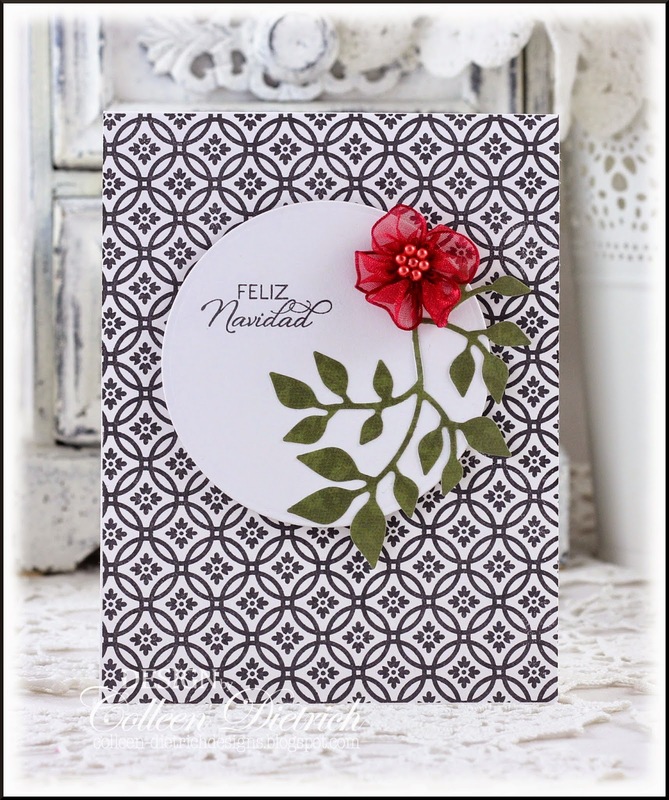 Stamps: Winter Post - Stampin' Up! ; sentiment - Anna Griffin - HSN Paper: Very Vanilla, Always Artichoke, dark green pattern, Crumb Cake Ink: Chocolate Chip, Crumb Cake - SU; Memento Tuxedo Black - Tsukineko; Tea Dye - Ranger Fibers: sewing thread; cream twine - May Arts Accessories & Tools: Top Note die - Stampin' Up! 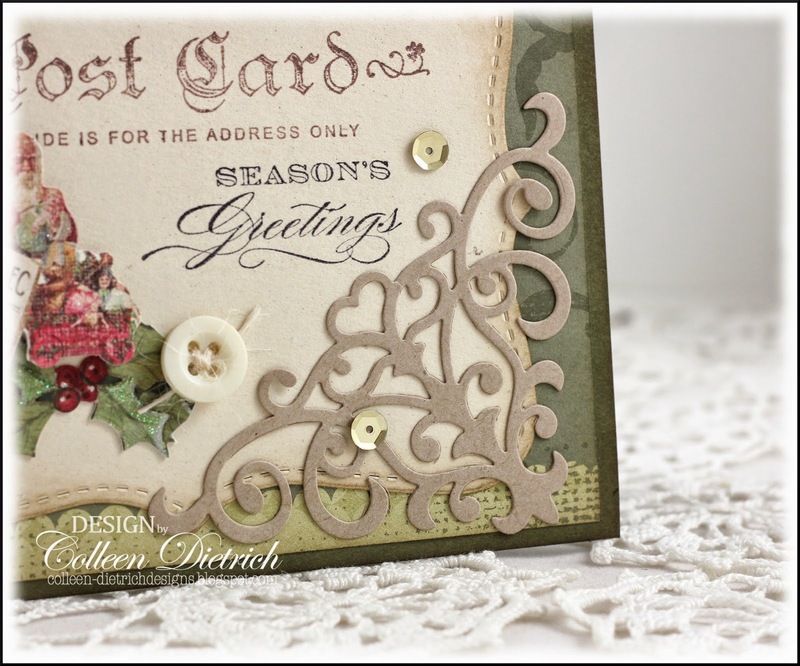 ; vintage buttons; gold sequins - MJ Trimming; Corner Flourish die - Spellbinders; Santa, Holly die cut borders - K & Co.
Good heavens, but this is a busy card! 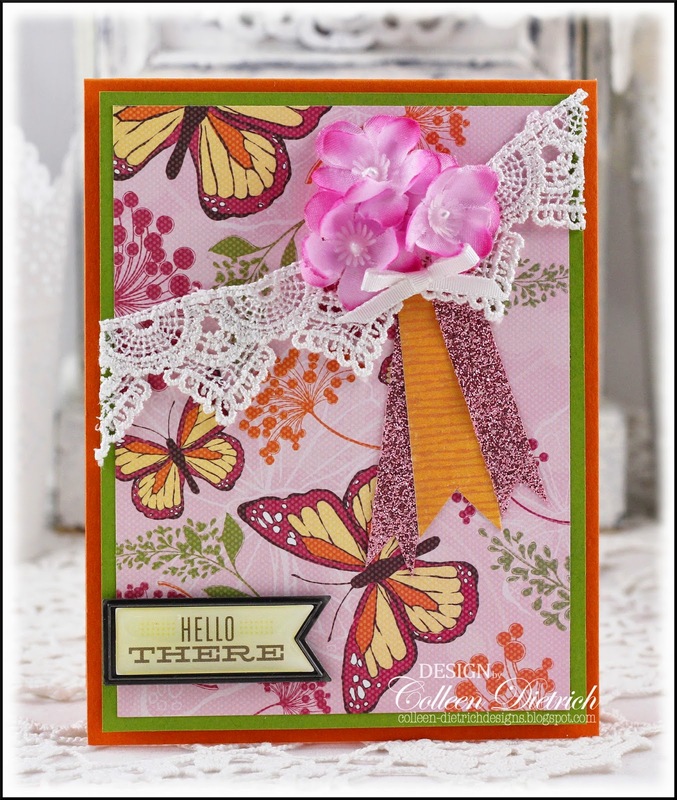 It began with a panel of butterfly-print patterned paper from Stampin' Up!, and was built from there, pulling colors from that paper. The pink glittery banners are actually glitter ribbon, bought for pennies after Christmas from JoAnn's. No stamping on this card. The sentiment is an epoxy and metal sticker from American Crafts, found at TJ Maxx a few years ago. Welcome back! 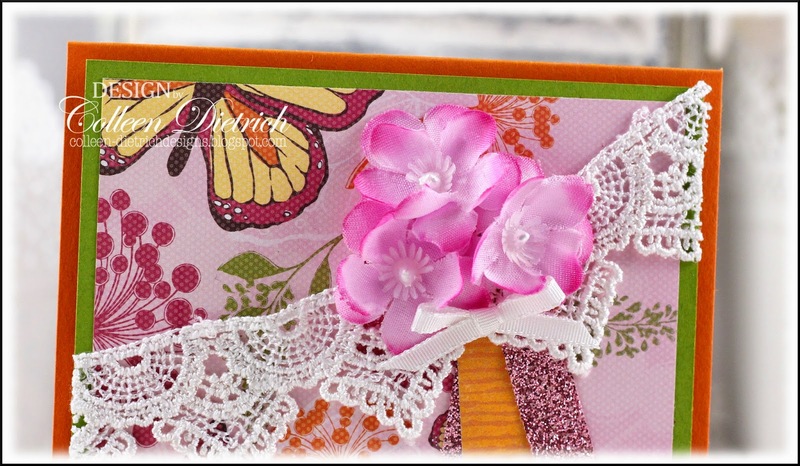 Stilllll sharing photos from my archives, of cards that never made their debut here on my blog. How 'bout these bold colors? I know, it's rare to see them here. 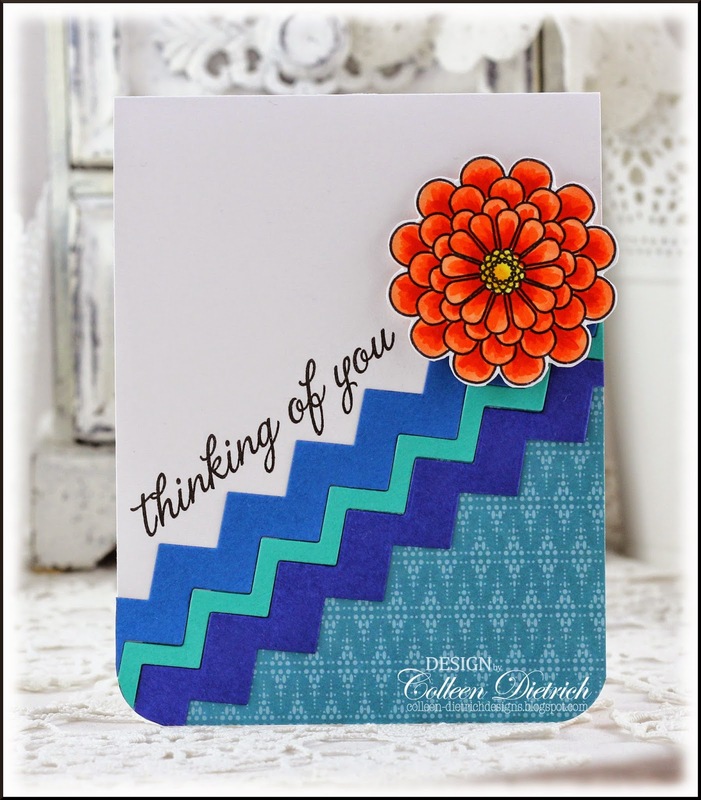 One day, I just felt like using up some blue cardstock scraps, and built a card around them with My Favorite Things' Chevron Stripes dies. I found some zigzaggy patterned paper in my stash that harmonized with all the blues. 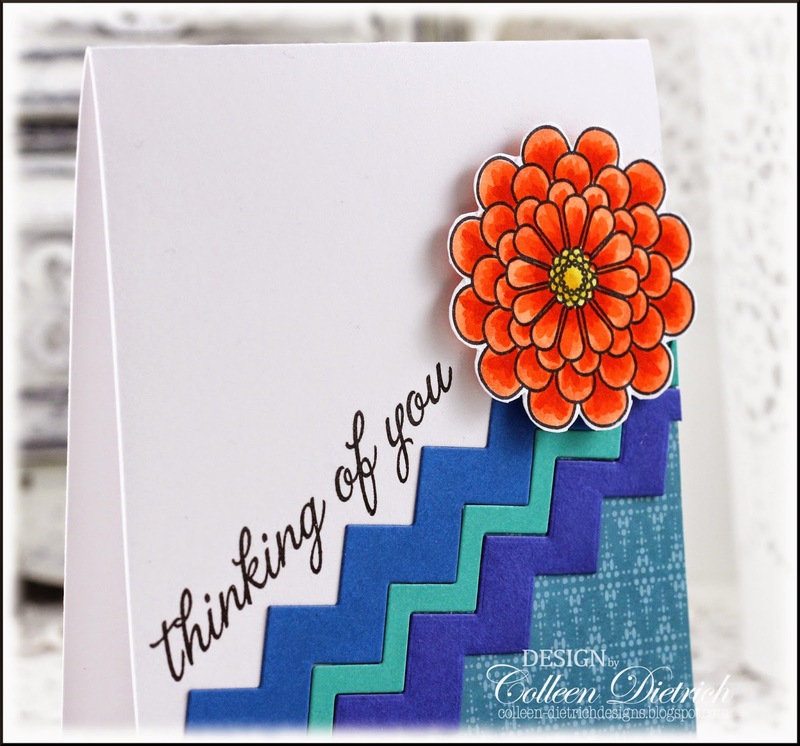 A bright orange flower from Verve's Brighter Days seemed a good choice to temper all the cool tones, and a sentiment from Hero Arts leads the way. I am SO glad you could join me here today! Oh, you've caught me, still digging in my photo archives for things I never shared here before. Like many of you, I have a hard time throwing out little things that I think will be useful in my crafts. 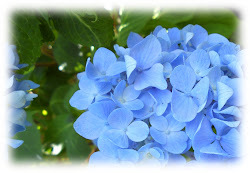 Well, these purple silk hydrangea blossoms fell off a flower arrangement I used to have, so I saved them. 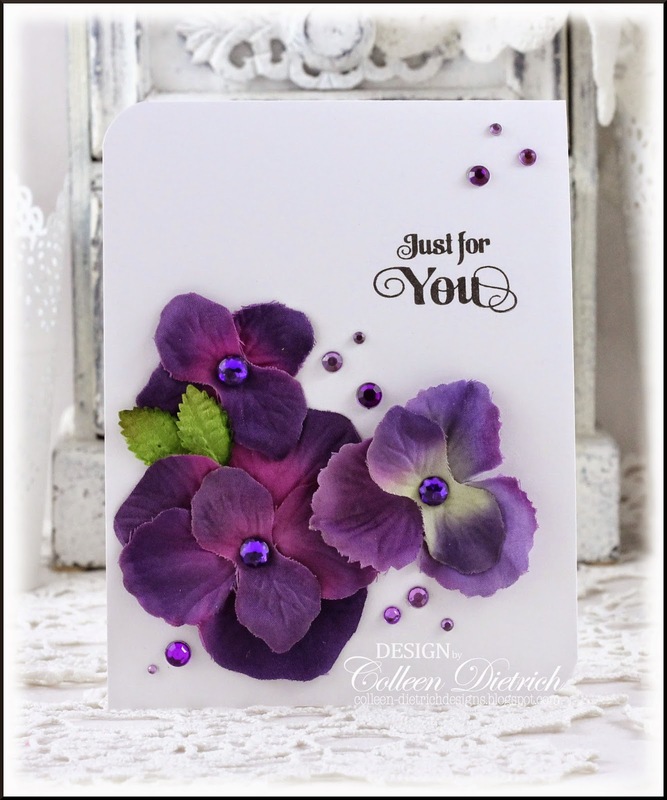 I love how they dress up the card, especially when paired with an abundance of purple rhinestone gems and a couple of little leaves. This is intended as a bridal shower card, and is in a shop (or hopefully, it's sold by now), but with that general sentiment, it could be for any number of occasions. It was submitted to Paper Crafts Magazine, but not chosen. I forgot all about it until recently. 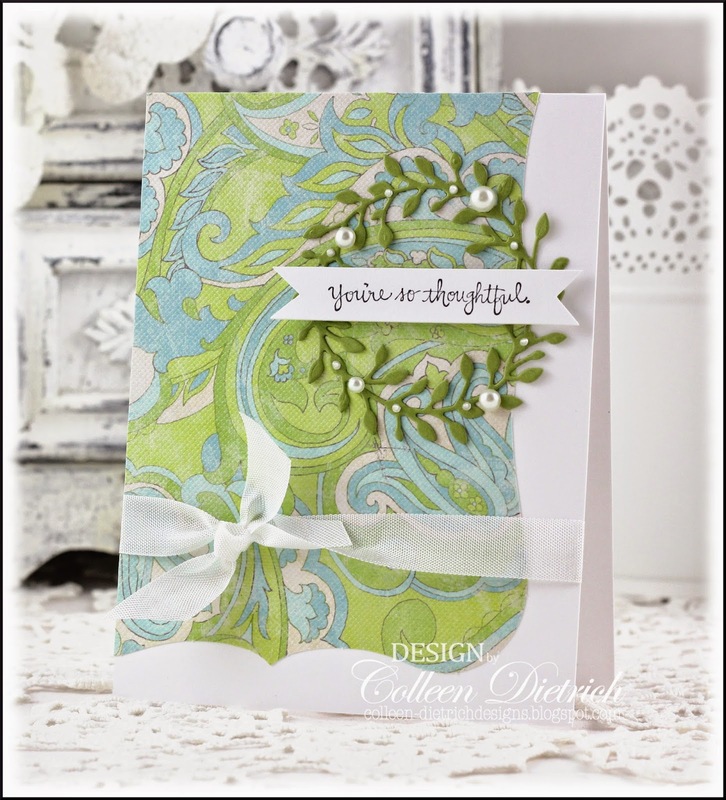 The background is Punched Tin from Market Street Stamps, and the sentiment is from Verve. Thanks for letting me share this oldie with you! I think the overall design has a Thanksgiving-ish feel to it, but I'd love to give it at any time of year. There truly is something to be thankful for every day. 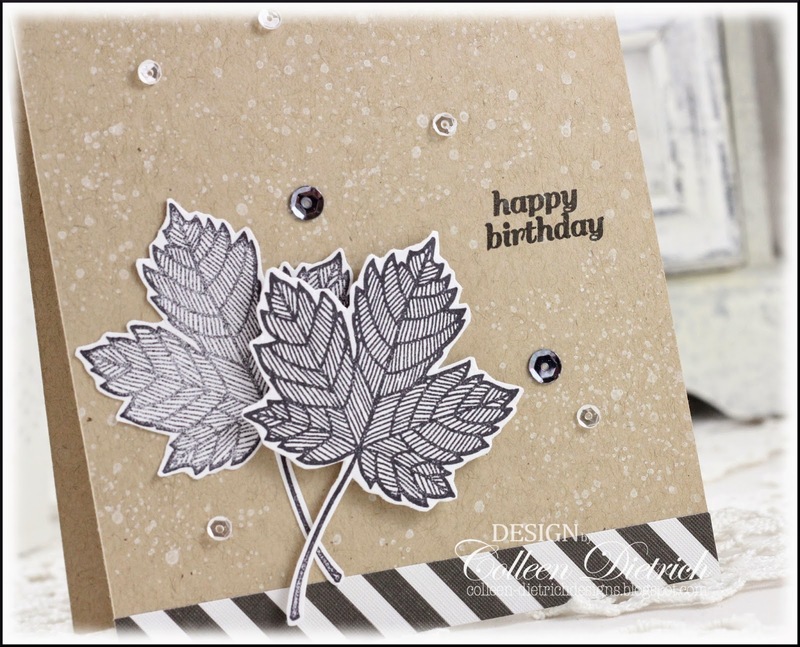 In the background, you can see the Hardwood stamp from Stampin' Up!, a new-ish purchase for me. 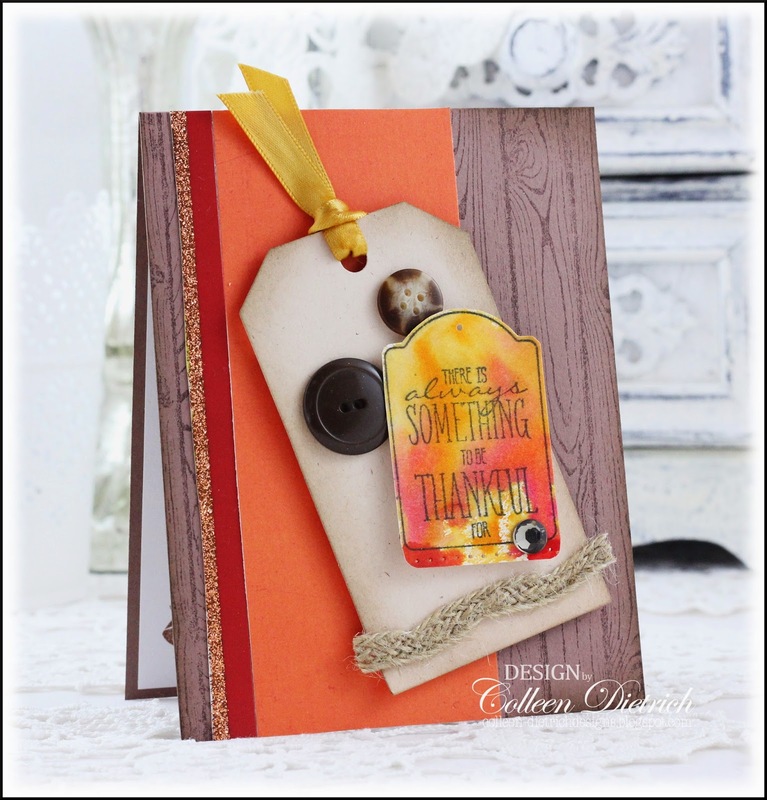 Then, I layered on bits of a salvaged store-bought greeting card (the orange, red, and glitter), and a fun tag. The tag is from a friend, and it had some buttons attached to it, though not these, and also the satin ribbon. I strategically covered the holes with vintage buttons and the sentiment, which had been colored with Distress Ink sprays by Ranger. Had received a bunch of them for Christmas, and this is the first time I played with them. Very thankful YOU dropped by today! Enjoy your weekend!